One issue made of this outcome is that the winning decision to leave has been supported more by older people who will be less affected by the decision over time whilst the losing decision to remain has been supported more by younger people who will be more affected by the decision given their greater remaining lifespan. This got me thinking of a voting system whereby the impact of an individual’s vote is adjusted by a weighting; the younger the voter the greater the weighting. 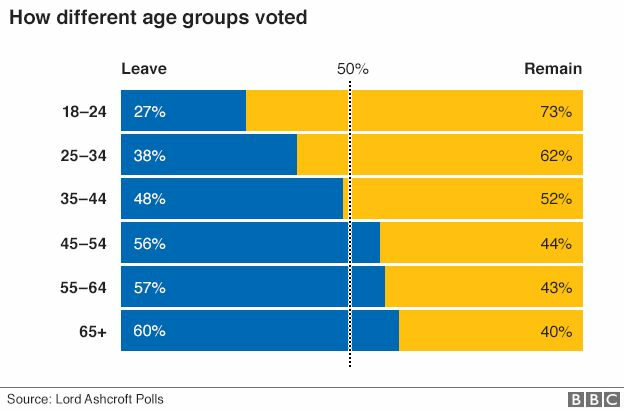 I was going to write up an example of this idea applied to the Brexit vote, but just found the following article which espouses the same idea: Here’s what would have happened if Brexit vote was weighted by age. Such a voting system would only apply to decisions with direct long term consequences. Some might claim it ageist, but I see it as a perfectly reasonable way to incorporate consideration of the impact a voter has on a decision and the impact the decision will have on them.